Many apps use the UIAlertController to display information the user for them to acknowledge with an “OK” button. A UIViewController needs to present the alert controller to the user so I wrote an extension on UIViewController to handle this. 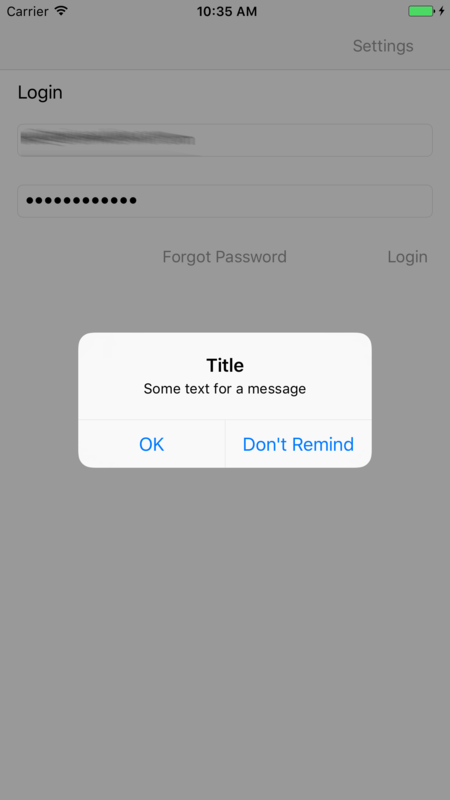 This extension has a function that takes a title string, a message string, they style of the alert (alert or action sheet) and optionally a “Don’t Remind” key. The “Don’t Remind” key is a string that’s used as a key for UserDefaults. If this key is provided, the alert controller will include a “Don’t Remind” button on the popup. Then next time this function is called with that key, the value in UserDefaults is checked. If the user previously tapped, this button it won’t be shown again. This is good for introductory information or certain warnings the user may not care about. You can see that there’s just one function and it’s parameters. Note it’s presenting the alert controller on the main thread. Otherwise, create the alert controller and add the “OK” action (with no handler closure). If the dontRemindKey is not nil, create the action for that also and in the handler set the UserDefaults value to true for that key (and synchronize to store the value now). Since the alert action handles the callback when the user taps a button, there’s nothing else to do. If you have a way of doing this, please share it in the comments. Thanks! 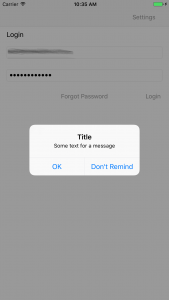 This entry was posted in How to make an App and tagged alert controller, extension, swift. Bookmark the permalink.